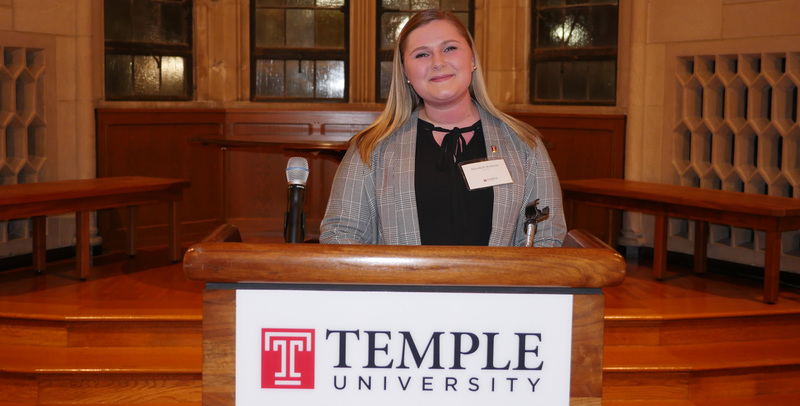 Merideth Ketterer is a member of the Temple Law Class of 2019. During my second year at Temple Law, I was interested in developing practical legal skills that I could use at my summer associate job. I studied abroad in Rome and worked as a research assistant throughout my first summer of law school, so I didn’t have real world experience in the legal field just yet. The Integrated Transactional Program (commonly known as ITP) was the perfect opportunity to focus on my professional and legal skills in a classroom setting. The 2-semester, 10-credit sequence, led by Professor Robert Bartow, combines Trusts and Estates, Professional Responsibility, and an experiential component. Trusts and Estates is taught in the fall semester, while Professional Responsibility is held in the spring. One evening per week in both semesters, students are separated into smaller groups to practice lawyering skills with an experienced lawyer or judge as an adjunct professor. ITP builds on what students are learning in the classroom with the knowledge and confidence to apply these skills in practice. Students gain experience interviewing clients, drafting estate planning documents, negotiating contracts, and much more. Some exercises confront ethical questions in which students are required to put the Rules of Professional Conduct to use. ITP allows students to grapple with difficult decisions and the proper course of action before graduation. For example, who is the client? How should a new associate handle a disagreement with a senior attorney? What if a client is involved in illegal conduct? The smaller classes deal with several simulations where students interact with “clients” (played by 3L teaching assistants) with different backgrounds and personalities, in need of legal advice. Students encounter clients ranging from a widow who wants to make sure her children inherit the family business to a pro bono case of a man who has a brain tumor and needs documents drafted quickly. Discussing sensitive topics is not always easy, and one of the skills learned from ITP is how to make the client feel comfortable. If you are interested in transactional work or are unsure of whether you want to litigate , I would say ITP is for you. Statistics say that a majority of lawsuits never make it to trial, which means litigators need to be equipped with training outside of the courtroom. The skills taught in ITP, such as client interviewing, will be just as valuable in a civil or criminal litigation setting as it will be for more traditional transactional work. Another benefit of ITP is the Professional Responsibility (PR) course, which is required for all Temple Law students before graduation. The course is taught around the Rules of Professional Conduct and allows students to think about how they would respond to ethical problems. PR also helps with the Multistate Professional Responsibility Examination (MPRE). The MPRE is mandatory for admission to the bars in all states, except three. Many ITP students choose to take the MPRE in March when the PR material is fresh in their minds. At my summer internship after 2L year, I felt prepared and confident in my abilities. The firm was impressed by my ability to write memorandums, draft Wills and other estate planning documents, and communicate effectively with the senior attorneys. I was even given the opportunity to run a few client meetings myself – all thanks to ITP. Views expressed by members of the Temple Law School community are those of the author and do not necessarily reflect the views of the Law School or Temple University. Copyright © 2019 Voices at Temple.